The confrontation of Schubert's Sonata in G-major, op. 78 and Schumann's set of variations “Symphonic Etudes”, op. 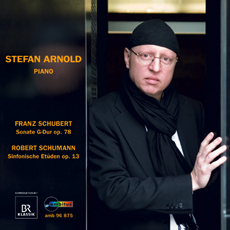 13 illuminates – or even better – makes audible two areas of conflict: an architectural and musical conflict, where the extreme spaciousness of the Schubert sonata is opposed to the extreme compactness of the Schumann variations. On the one hand, the symphonic etudes are a virtuosic challenge, while on the other, the Schubert sonata is no less inferior in it's high art of pianistic colours. Two of the greatest creations of the romantic musical era, if not of the entire keyboard literature.